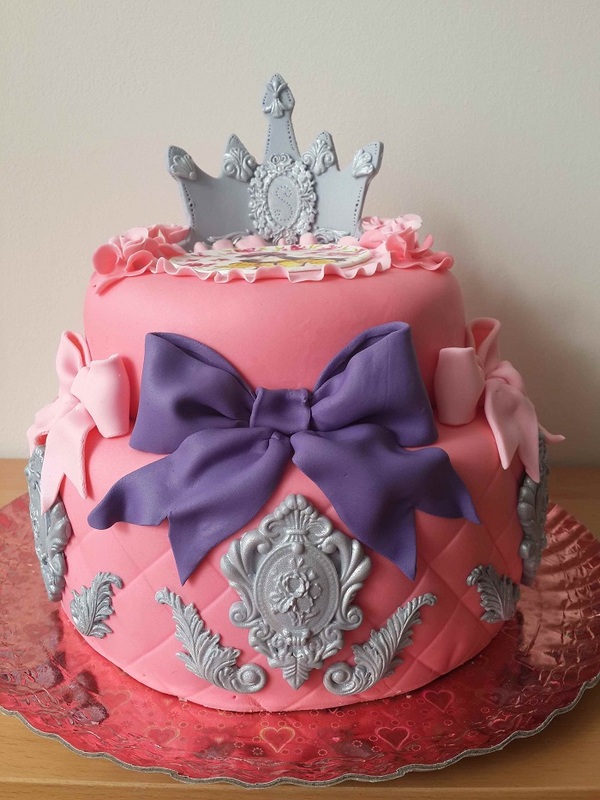 This very girly princess cake was made for my very dear niece Shira. She lives in Detroit but was coming to Israel for the summer, and was going to celebrate her fifth birthday party here with her cousins. For a whole year leading up to this special day, Shira thought and dreamed of the cake she would have. She actually has quite an obsession with cakes. She loves custom cakes and enjoys watching the ‘big names’ in the cake decorating world make cakes. Because of that she had some pretty high expectations! Looking back at the cake, I can say that what really gave it the “Princess” “Royal” touch was a combination of the silver crown and ornaments and the fabric like 3D ribbons. She obviously chose pink and purple for the colors. Even the platter was a metallic pink! I also painted a princess on top. That really got her excited! Stunning! A perfect cake for a granddaughter from a loving Bubbie. I’ll be sure and order one for my granddaughter’s next birthday!